Efficient layouts always develop from the general to the specific details, never the other way around. Think of a rope—when it's tugged, the entire length is affected. Facility layout is similar. All the parts make up one interconnected whole. Understanding the logical movement of people, materials and product traveling between the front door and the shipping dock is the primary challenge of developing an efficient plant layout. The ultimate goal is to optimize the workflow of these components, today and into the future. If the production process was simply a matter of one person handing work to the next person in line, the task of designing an efficient layout would be simple. The operations of an embellishing facility can be treated as if each were a single individual that simply hands the work down the line, similar to a bucket brigade. But, even with this simple model, we can see that there is nothing like a bucket brigade in our industry. Each department has multiple interactions with the others—and we haven't even mentioned prepress, all the work in process, staging and other material handling. If handled incorrectly, shop layout can actually limit productivity. Over time, we find ways to adapt to the hardships imposed by the positioning and location of equipment and materials, severely stunting operations. To create an efficient workflow within the production work area, each part of the process needs its own space. Also, staging production has to rank as one of the more important considerations for the facility environment. The physical workflow starts in receiving, then moves into a staging area where the raw product is prepped. From there, it is decorated and finally the garments are finished, packed and made ready for pick up or shipping. A clearly delineated route along this path is necessary for a clean flow of work. Each work area has specific tools that are applicable only to the procedures of its part of the production loop. Allow enough space for workers to have all supplies necessary for each work station stored in that area. 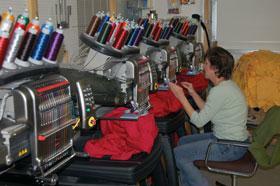 Production equipment is available in all kinds of configurations. Determining the right equipment and its proper layout is critical. Start with a general understanding of production needs. Flexibility and technology should also be significant factors in determining the type of machines installed. This also comes into play with run sizes that continue to shrink—flexibility and efficiency provides the most versatility. Once that's determined, the next goal is to position equipment in a way to accommodate products moving through the shop efficiently. Consider also the production loop—rely on logic to determine the layout of equipment, but this will often depend on the floor space actually available and the physical dimensions you have to work with. The most expensive part of the screen printing process is usually the setup/prepress stage, so do not underestimate how much space is required to perform this crucial step properly. We have come to accept that, as long as the equipment is running, we're accomplishing some level of profitability. Conversely, the machines are just costing money when they're idle. The purpose of everything in the plant is in support of this premise: Keep the equipment moving. With this in mind, consider that the most expensive part of the process is usually the setup/prepress—the art, separation, digitizing, output and everything we do before we decorate. So, what's the most efficient layout of a prepress department? For starters, do not underestimate the space needed. I've been all over the world on different projects and would say this is where most folks fall short. When allotting space, simply remember the importance of prepress to our process. There are many theories on process and production layout. We've come to recognize the decoration process as a loop or linear configuration, so this is how we want to lay out our process. Much like our industry as a whole, planning an efficient layout or floor plan contains elements of both art and science. Creative problem solving, as I like to call it. Analyze production flow and think about departmental interrelationships and physical applications. This can minimize potential waste of motion, time, energy and, ultimately, money. Departmental relationships have a direct influence on workflow, growth potential, equipment placement, total footprint needed as well as lighting, power, mechanical and many other issues. The primary objective of the floor plan is to arrange production in a logical order from beginning to end. Flow is our directional planning tool. There are a couple of ways I like to consider this. The ideal situation, and my favorite, is the horseshoe approach. The other is a linear approach. Unless you start from scratch and build your own building, the building or space will largely determine which approach is most suitable. Imagine how multiple orders will flow simultaneously through the facility. Picture each work station engaged in its own order and its own responsibilities. This is a great exercise, no matter how efficient the operation may be. Many times, assumptions are made about production flow, and the real situation may not be communicated entirely. These issues can be addressed when planning a shop layout. Many of the factors that will determine a facility's floor plan are strictly a matter of personal preference, while others are based on eccentricities of a particular facility and production need. On paper, layouts often seem easy. In real life, a few small errors in calculation can cost a fortune in lost productivity. As an exercise, try laying a clear piece of film over your potential floor plan and use colored markers to track the movement of people, product and materials. When you are finished, ideally, the arrows should cross only minimally. Pay equal attention to all the different disciplines to allot the space each requires. Picture each work station engaged in its own order. While this type of loop is designed to maximize productivity and minimize bottlenecks in the process, I would be remiss if I did not mention safety and health. All of the aforementioned conditions mean nothing if the employees are not working in a safe environment. The considerations of escape routes, fire extinguishers, eyewash and first-aid stations are of equal importance. If we arrange our floor plan in a logical order from the beginning of the process to the end, we have determined the layout is the process of flow. One useful tool in the architectural planning process is to write each need or desire for your shop on a card. Organize these ideas into patterns and lists and study the flow of people, product and materials through the facility. All decorating mediums will be a little different. The screen printer knows whats most important for them, but that view may differ from the embroidery, digital or transfer departments. If we can get all of the needs and fit them together into the process, we can lay them into a footprint. Ideally, shop layout should provide direct routes between production areas, allowing the best use of time and to maximize efficiency. Always keep in mind the objective in developing a layout: to create an efficient workplace. Within a well-planned work environment, production processes move smoothly from one step to the next. The shop should be safe and orderly while productivity can be maximized. In our world of decorated apparel, every product can be different, every client's need is unique and, sometimes, every embellishment is different as well. This makes efficiency hard to achieve, especially in multiple decorating atmospheres. Even in the perfect process loop or linear configuration with perfect utilization, money and time can be lost simply in how an order flows through production. For this reason, decorators are constantly rethinking, reinventing and rearranging in order to achieve the best solution based on their variables. Plant layout is a dynamic, rather than a static, concept. This means that once complete, it is not permanent. It's important to evaluate what improvements or revisions to the existing plant layout must be made regularly. This should accommodate staying up with development of new machines or equipment, improvements in manufacturing processes and changes in materials handling devices. But, any revision in layout must be made only when the savings that result from the change exceed the costs involved in such a revision. Additionally, revisions in plant layout may become necessary because of an increase in the output of the existing product, introduction of a new product and/or diversification or technological advancements in machinery, material, processes, product design or deficiencies in the original layout. Industry consultant Lon Winters is president of Print This, Inc. and Graphic Elephants, LLC. 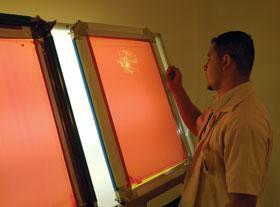 During more than twenty years in screen printing, he has won more than 40 international industry awards. Those include SGIA Golden Image Awards, Printwear Awards, Impressions Awards, and FESPA Honors. He is an honorary Golden Image judge; has published numerous articles and monthly columns; and leads seminars and workshops for a wide array of industry professionals. Since the day he began his career by reclaiming screens, Lon has been involved in virtually every aspect of screen printing and embroidery. After managing operations large and small, Lon launched businesses dedicated to training, and consulting. 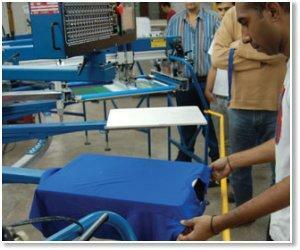 Print This conducts popular seminars and workshops around the world for manufacturers, vendors, and garment decorators. Graphic Elephants is a screen print and embroidery design and development studio specializing in new techniques for clients with high-end work and short lead times. Located in Elizabeth, Colorado, Lon can be reached by phone at 303-910-0477 and by email at lon@graphicelephants.com. 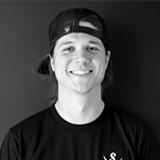 His website is www.GraphicElephants.com. How Much Does T-shirt Folding Actually Cost My Business?